Spring Bayou. Photo courtesy of the State Archives of Florida. Tarpon Springs is a quaint little fishing village named after a type of fish that thrived around the waters of the city in the late 19th century. This small town is located on the Anclote River less than a mile from the Gulf of Mexico, is famous as the “sponge capital of the world,” and is known for its delectable seafood. The establishment of the commercial sponge industry began in the 1890’s and made Tarpon Springs the prominent fishing town it is today. American settlers had discovered sponges in the Florida Keys during the 1820’s. The Gulf Coast sponge beds were discovered by coincidence in 1873 by Key West turtle fishermen whose nets were fouled by sponges off the mouth of the Anclote River. Spongers came to the area to work the beds, and some moved to Tarpon Springs. In 1890 John Cheyney, a Tarpon businessman, opened the Anclote River and Rock Island Sponge Company across the river from Tarpon. During the 1890s, sponge packing houses were built in the city, sponge presses were installed, and buyers moved to town. Gradually, the sponge business shifted from Key West, Cuba, and the Bahamas to Tarpon Springs, and by 1900 the city was considered the largest sponge port in the United States. Deep Diving at “Spongeorama” 1972. Photo courtesy of the State Archives of Florida. Greek immigrants expanded and refined the sponging industry. A man named John Corcoris brought Greek immigrants to dive for sponges at Tarpon Springs. He arrived in 1896 as a sponge buyer for a New York firm. He went to work for John Cheyney, the sponge entrepreneur who financed Corcoris’ early efforts to make the industry more efficient. 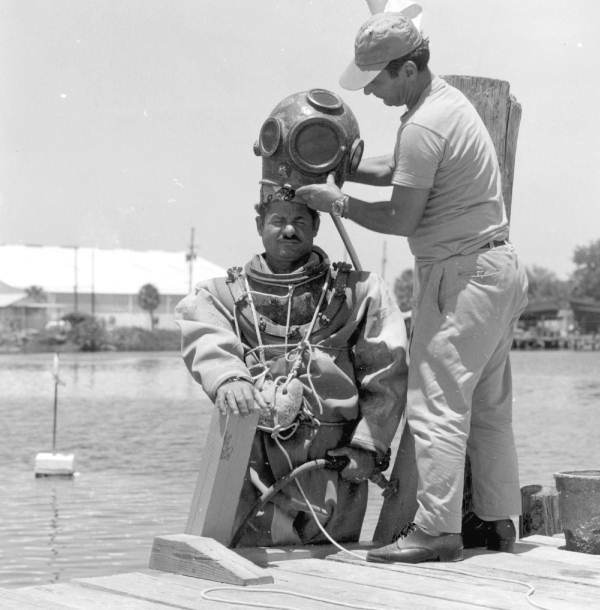 In 1905, Corcoris introduced the first mechanized sponge fishing boat to Tarpon Springs and brought in 500 Greek divers from the Greek islands. More Greeks migrated to Tarpon Springs and businesses were established to serve the growing community. Sponge merchants and brokers then came to Tarpon, and their presence helped to create a well-integrated industry. They built boats, loaned money to boat owners, and supplied tools and equipment to the entire sponge fleet. In 1906 the Sponge Exchange Bank was established, and in 1908 the Sponge Exchange was founded. Profits from sponging also financed other businesses, such as the Sponge Exchange Cigar Company. 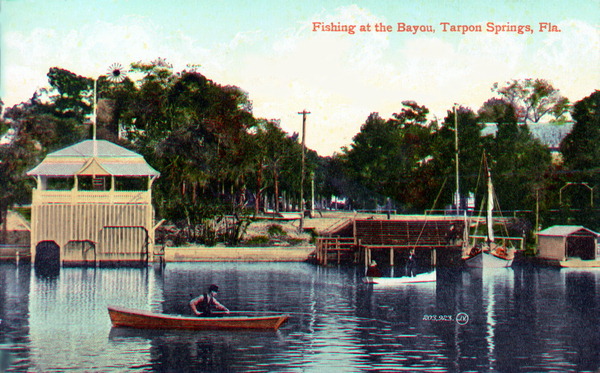 During the 1920s, Tarpon Springs experienced a real estate boom and an increase in tourism. New subdivisions were laid out, tripling the town’s original size, and a number of commercial buildings were constructed, including the Sunset Hills Country Club, Arcade Hotel, Villa Plumosa, a new high school, an amusement pier, a water plant, and the city’s first hospital. Tarpon Springs’ popularity dwindled in the mid 1920’s. In 1926, the city suffered during the collapse of the Florida land boom. Tarpon Springs was also ravaged by the “Great Miami Hurricane” that hit Florida in September of 1926 and increased the state’s economic troubles. The sponge industry prospered, but in 1938 a blight infested the sponge beds and many of the sponges died. Today, tourism has replaced sponging as Tarpon Springs’ major source of economic growth. Thousands of tourists come to the city each year to enjoy fishing, visiting the original Sponge Docks, experiencing Greek culture, shopping, and touring charming Victorian neighborhoods. “Tarpon Springs Area Historical Society.” TARPON SPRINGS AREA HISTORICAL SOCIETY – Historic Train Depot in Downtown Tarpon Springs. Web <http://tarponspringsareahistoricalsociety.org/history.html>. Florida Backroads Travel. (2018). Tarpon Springs Florida. A History of Sponge Diving and Great Greek Food. [online] Available at: https://www.florida-backroads-travel.com/tarpon-springs-florida.html [Accessed 5 Jun. 2018]. This entry was posted on Tuesday, June 5th, 2018 at 1:29 pm and is filed under Uncategorized. You can follow any responses to this entry through the RSS 2.0 feed. Both comments and pings are currently closed.